Big data and computational modeling have the potential to fundamentally change the way patients are diagnosed and treated. Since the 20th century, diseases and other biological systems have been considered in isolation—which is described as a reductionistic approach. Today, interdisciplinary researchers are using the wealth of medical data being generated by new technology to take a more holistic approach to healthcare—focusing on biological processes within the patient. Instead of understanding complex diseases by studying their individual components, systems medicine looks at how cells, genes, and tissues interact to cause disease. Since the term “systems medicine” was first coined in 1992, there’s been an explosion of interest in the field, with the number of papers published increasing by an estimated 41% per year up to 2015. Speakers at the 2nd Conference of the European Association of Systems Medicine 2018, held recently in Utrecht, the Netherlands, presented new computational models for studying complex diseases and assessing patient risk, as well as novel interdisciplinary research. Understanding complex diseases on a molecular level is among the research topics covered by systems medicine. Complex diseases, such as asthma, Parkinson’s, multiple sclerosis, and cancer, are not caused by a single genetic mutation. Instead, multiple genes, signaling pathways, and regulatory networks are involved. One challenge is identifying the combinations of genes involved in a complex disease, Dr. Baumbach explained. Even in monogenetic diseases, such as Huntington’s disease, which are caused by a single gene mutation, the disease-causing gene is often expressed the same in patients with and without the disease. In more complex diseases, such as cancer, where multiple genes are mutated, the situation is even more difficult. Grand Forest, an ensemble learning platform developed at the University of Southern Denmark and the Technical University of Munich, has been optimized for discovering disease-associated modules from genomic profiling data. The platform may be accessed online, and it provides for supervised and unsupervised analyses of decision trees. Dr. Baumbach specializes in using artificial intelligence (AI) approaches, such as machine learning and random forest, to find the most likely combinations of genes. His trick is to pick ensembles of genes that, although not individually linked to a disease, are part of the same molecular pathways. In patients, these groups of genes can work together to drive a disease state. He also uses unsupervised learning to stratify patients with, for instance, asthma into subgroups from scratch (called de novo endophenotyping) using disease mechanisms, rather than individual genes or gene panels. With this technique, patients are deliberately not grouped by phenotype, but are—instead—clustered in subgroups by an AI. Dr. Baumbach hopes that in the future this technology could be used to tailor treatments to individuals—perhaps by giving multiple drugs at lower doses to reduce side effects or to repurpose drugs that target the molecular networks involved in their disease. Classification of diseases by their molecular mechanisms was also the topic of a talk by Timothy Radstake, Ph.D., a professor of translational immunology at the University Medical Center Utrecht. He discussed using molecular data to develop clinical models of Sjögren’s syndrome and interocular lymphoma. “We started five years ago to really delve into this niche in a data-driven manner. Most researchers focus on certain molecules, but we decided to use big data to look at multiple subsets of immune cells,” he explained. Dr. Radstake uses a variety of techniques, including RNA sequencing, proteomics, transcriptomics, metabolomics, and sequencing of the epigenome to classify diseases by their molecular biomarkers. From there, his team has developed a computer model to predict the risk that patients with uveitis will develop intraocular lymphoma. They developed a tool where they punctured the eye and extracted a little fluid, before doing a simple proteomics analysis. “We think it predicts intraocular lymphoma two years earlier so, if successful, this would potentially lead to earlier treatment for these patients,” he said. The model is now being trialed as a diagnostic aid. He designs novel tools for a variety of projects, including deconvolution and benchmarking approaches to studying immune cells. “Most studies do bulk sequencing of tissue, including skin cells, so if you deconvolute data into different cells, you can see which cell type is most important to focus upon,” he explained. Another aspect to systems medicine is studying the patient as a whole, including the effect of their environment, or exposome. “There is not much known about how environmental factors affect wellbeing, and in systems medicine people’s focus is mostly on developing personalized medicine and the molecular pathways that contribute to disease,” said Tjitske Bezema, Ph.D., chair of Immunowell and founder of Hidden Health Solutions. She is leading a grassroots initiative to understand how lifestyle and other environment factors affect the health of patients with two autoimmune intestinal diseases—Crohn’s disease and ulcerative colitis. Working in coordination with researchers from the Amsterdam Medical Centre, Utrecht University, and VU University Medical Centre in Amsterdam, Dr. Bezema is piloting a study of what makes patients enter remission using a technique called Participatory Narrative Inquiry (PNI). “It’s a normal well-used technique in social science, but is not used in this context, so we got together a team of researchers interested in trying it,” she explained. 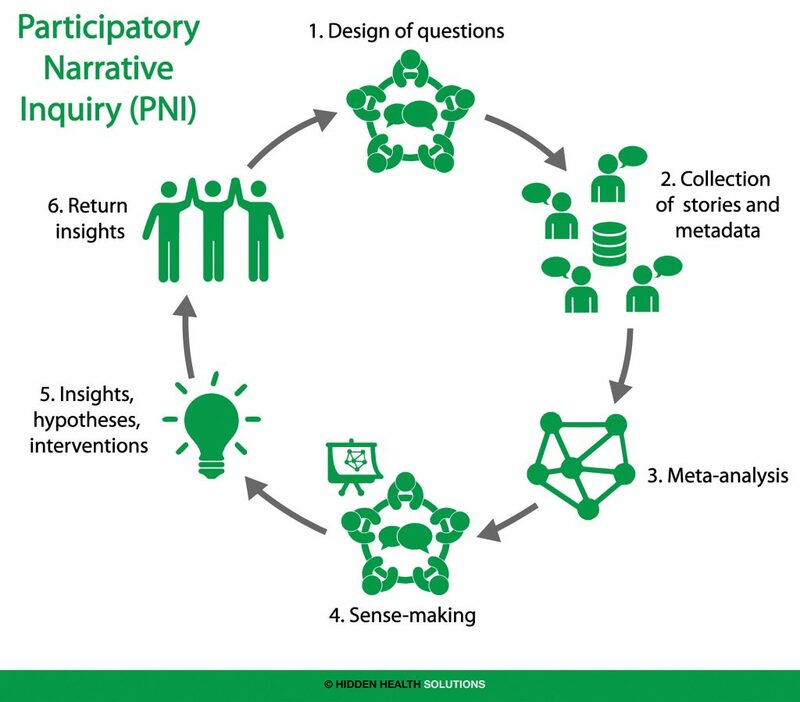 At Hidden Health Solutions, data about people’s daily experiences are collected and studied using a six-step method called Participatory Narrative Inquiry (PNI). At present, Hidden Health Solutions is using PNI to discern patterns in the experiences of people with chronic illness, and to gain insights about what improves their quality of life. The final PNI step, “return insights,” may occur online or via mailings or meetings. Recruiting from patient groups on Facebook and by leaving flyers with clinicians, Dr. Bezema had patients write down the story of a time when they felt better. This was accompanied by semi-quantitative and quantitative questions, such as whether their medicine had changed, how much their symptoms improved (on a scale of 1 to 10), and which symptoms got better. “By collecting experiences from patients in a structured way, and analyzing them, you can see if there are patterns emerging from what people have in common,” she noted. So far, Dr. Bezema and collaborators have collected 65 stories, and from her preliminary analysis she thinks stress and self-esteem might be important topics, as well as exercise and diet. She’s planning to hold a sense-making session in January 2019, with doctors, researchers, and patients, to make a more thorough analysis of the data.